I've got the framework now in place - clicking on the remove button, if it is a speculative trade, will show the following pop up. The actual value table will show on the right, and I've yet to fill in some of the data. And this is another user control. And the UI needs work but it is the first draft. However, I've decided to add the actual value table as a user-editable table to be attached to the version in play. Which means the simple version editor will get a bit more complicated, but it also solves, or rather bypasses, the issue I wasted way too much time on yesterday: getting an enumeration (the cargo codes) to be a combobox (list of choices) to display and work in a list of the versions. So now there will be an 'other options' at the end of the version editor to allow you to enter the cargo code type and enter the true value lists. I also need to work on the trade code part. 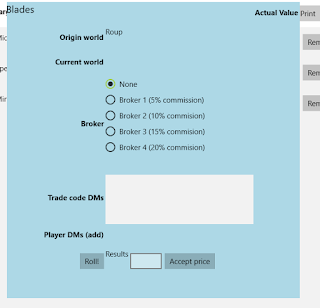 I've got most of it in place, but the DMs are also version dependent or should be, so I may have to extend the trade codes table to also be linked to the version. Doing this version-dependent thing, and not actually supplying the data, may allow this to get published without issue, but I will still be checking.